If you are looking for a vintage style wedding dress from the 1970's for your vintage wedding, why not wear the real thing? Vintage wedding dresses from the 70's can be found on eBay for a very good price, and most are in pristine condition, ready to be worn for another bride. Vintage 1970 wedding gowns can be found in full length gowns or short mini dresses. Many styles were popular during the 70's, but the hippie styles, including lovely lace, and crocheted wedding gowns, as well as a prairie style, and Victorian wedding gowns were all worn during the 1970's. You can also reproduce a 1970's style wedding dress using vintage sewing patterns from the 1970's. Sewing patterns are easy to come by, cheap, and cost almost nothing to ship. Then you can choose your own fabric and lace, size it perfectly, and yet still look authentically vintage in a new dress, and save a lot of money over buying a new "vintage" wedding dress. It is your choice when designing your wedding as to how much actual vintage items that you want to use or reproductions of vintage. 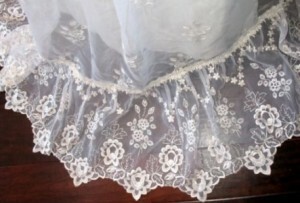 But the authenticity of real vintage apparel, and accessories including table settings, tablecloths, and centerpieces is something that not only reduces the price of your wedding, and adds to the vintage appeal, but it is an eco-friendly choice when you reuse wedding items as opposed to buying new and creating more trash for the landfills. You can also give your centerpieces and accessories away to the bridal party members and other people who help contribute the most towards making your wedding a very special occasion for everyone. Paula Atwell (aka lakeerieartists), the owner of a small local gallery, Lake Erie Artists Gallery, in Cleveland, Ohio, is an artist, author, and a lover of all things vintage. You can follow Paula on Pinterest.